The blog dedicated to all things crafty business! Win a Ticket to Snap! 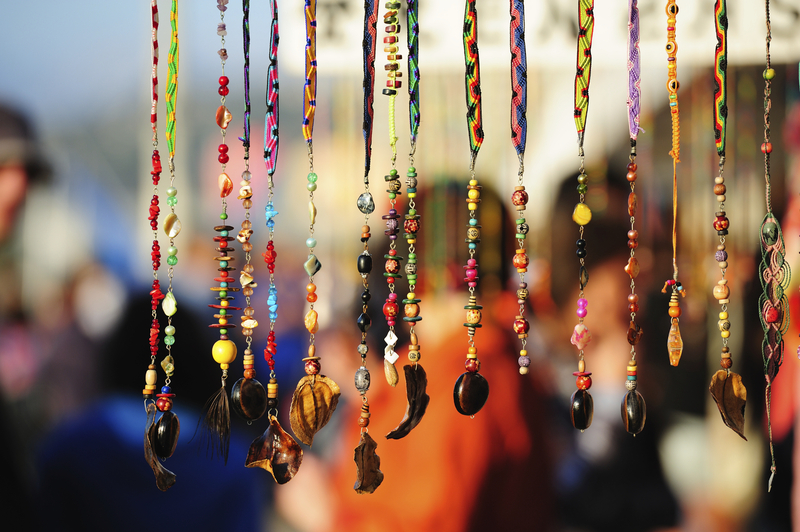 There are a lot of mistakes a seller can make at a craft fair. Thanks to a few great articles that I found online, I’ve gathered a list of what can be considered the top ten no-no’s at any craft fair. Whether you’re a veteran or a newcomer, make sure you avoid these mistakes. You get to the show, but you’ve forgotten part of your display, bags for people to carry their goods out, selling slips, or enough products to restock when things get low. The very first mistake you can make is coming unprepared. 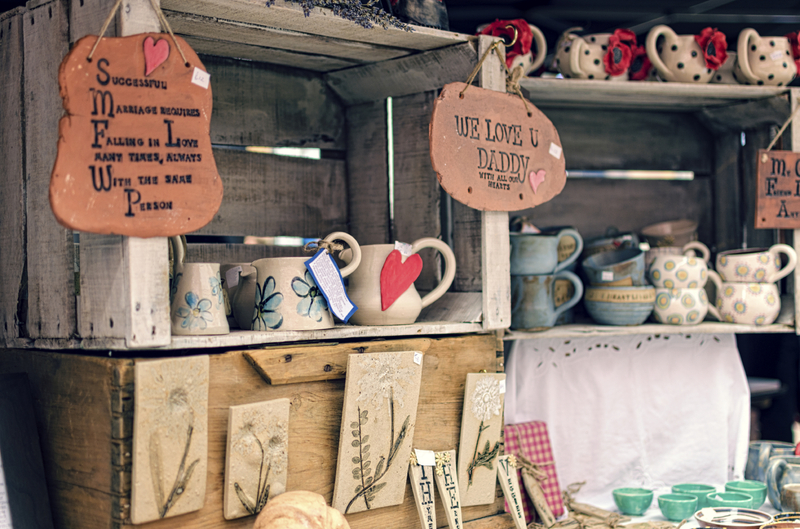 Make a list of everything you’ll need at the craft show and check them off one-by-one as you put them into your car. Forgetting a piece of your booth or not having enough products to restock as the day goes on are mistakes that you can easily prevent. Make sure you’re completely prepared before you arrive to the show because patrons will notice if you’re not. It can be nerve-racking to put all your products up for everyone to judge. You may not feel comfortable as a salesperson, but you’re going to come off as unfriendly if you don’t try to talk to people. Plus, you won’t build any customer relationships. A good practice is to say hi to everyone that walks into your booth. Make eye contact with them. If you see someone browsing for a bit, try striking up a conversation. Sitting in the back of your booth saying nothing, or talking to the friend you have helping you out, will only hurt you. Create a welcoming space in your booth. After all, you catch more bees with honey. For more service tips and advice, check out 7 Customer Service Mistakes to Avoid at a Craft Fair. This mistake is one of the harder ones to rectify. A good piece of advice to follow is to think of your booth as a product itself. The booth should represent your brand, so get creative in expressing that! Use bright colors or a creative way to display your products. If there’s nothing of interest right out front, people will be less likely to stop by. If you have too many products out and they’re not in any organized fashion, your booth is going to appear cluttered and overwhelming. If you have too few, people won’t be inclined to come in because they’ll have quickly browsed everything when they walked by. The key is balance. You want to offer enough products that they can’t all be seen right as you glance in, but not so many that it becomes overwhelming. This means filling the table, but in a way that encourages people to browse. Another good tip is top keep your displays dynamic, you don’t want your products just sitting flat on the table. Remember, you want to treat your booth as a product. This is crucial. You should have business cards readily available to hand out. They’re a great marketing tool. Hand them out to people you’ve had conversations with, give them to everyone who purchases something, and have them lying around for people to grab. Even if they didn’t find what they were looking for in your booth, they may think of a friend who would love your products and pick up a card. This is by far one of the BIGGEST mistakes you can make. If an item isn’t priced, many people will assume that it’s super expensive. Other people will be too shy to ask what the price is. Don’t miss a sale opportunity just because you’ve forgotten to price products. Make sure everything is clearly priced! There is nothing worse than getting a business card or flyer and the information is incorrect or missing. Make sure everything on your business card and marketing materials are up to date. If you’re only accepting cash and you don’t have enough change, then you can kiss that sale goodbye. Make sure you have enough change before you start the show, and take inventory of it halfway through in case you need to run to an ATM or shop to grab some more. Not everyone can afford to drop 70 dollars, so by having a variety of products at different prices you give everyone a chance to walk away with something they’ll like. Plus, it means more business for you. People are more likely to spend 15 dollars at a few booths on a couple of items, then dropping 60 on just one, so make sure you can offer both options. People always want a bargain. They love being able to tell all their friends, family, and coworkers about the deals they got. This can be tricky because you don’t want to end up losing money. Having at least a few items on sale will encourage those bargain hunters to buy. Plus, you could offer special deals. For example, if the customer spends 100 then they get a free item like a one-of-a-kind ornament. It might encourage people who are close to hitting that mark to purchase a few smaller items just to get that free item. What are other mistakes to avoid making at craft fairs? Do you love to create? Are you dying to turn your creativity into profits? You've come to the right place! Join our community of creative experts and learn how to sell your designs, how to get published in magazines, books or online, and pick up some great craft fair ideas and tips along the way. Thanks for sharing. Very good tips. Not a mistake but I do find that if I bring something to work on while I am there it draws people in to ask questions and take a look at what I have to offer. I sew but have even spent time at a craft fair painting ornaments and had people stop to see what I am doing. I make jewelry and sell at our local farmers market every week. While there I always have a piece of jewelry to work on and it really opens up a lot of conversations with my customers. Another idea I learned in retail is to compliment visitors to your booth. That seems to always open up a conversation. One other item I have learned about doing a weekly show is have a new item every week. It helps to keep people interested in your craft. Plus, I also take custom orders and request payment at time of order. It doesn’t seem to be a problem getting payment in advance either. I hope this helps some of you first timers. I make layered greeting cards and with this hint I might do some assembling of the layered embellishments. Thanks. That’s a great idea! Thanks for sharing! I totally agree with working on something as you sit in your booth. When people see you making something they know what they are purchasing is a one of a kind. I try to work on a jewelry piece but beads land up all over the floor. I macramé or something just to catch their attention. Easy…. copy and paste to a word doc and then print out… that is what I did. At one of my last craft sales I had an overload and many items that needed moving. I was tempted to lower all my prices. However, instead, I had a basket full of % off deals and a sign for folks to choose their items they wanted to buy, then pull a tag out of the basket to see what discount they would receive. I also advertised that there was one 50% off in there!! Wow, my sales were great that day… most got 10% off, others 20, or 30… and one lucky lady got the half price deal… and she told everyone about her great luck, and showed what she got … more people flocked by, even though they knew the 50% was taken! This is a wonderful idea… as soon as I read it a light buld went off over my head. I’m going to steal your idea! Its brilliant! Thank you! I have a large glass melon shaped jar- thats a GREAT idea! and I’d even include a few “CONGRATULATIONS! You won a free pair of earrings” or a free Whatever! Thank u for idea, I paint, painted some small ones 4 an 5 dollar ones, some with stands that came with the picture, they would say , the stand extra? They were happy the frame was the free gift, sold out on those. Thank you for sharing a great tip!! GREAT IDEA! I’m so going to use this! Thanks! Great hint. I will use it this weekend when I sell my handmade greeting cards. Great idea!! Thanks for sharing. I will try it at the next craft fair. Awesome idea! I am doing my first market this weekend and looking for great ideas to interact with customers. This is a great way to draw people in and connect with people. LOVE it! If a customer says, ‘That’s expensive!’ I ask her politely why she thinks so and I can gain good feedback from her reply. If someone says loudly, ‘Oh, that’s horrible!’ about something on your display, don’t take it personally. Try to suggest something else you have that she might like. If she refuses again, thank her for her interest and smile. It isn’t personal. I’ve never had any luck with a sale basket or discounted items. I agree with everything but the discounted items. A piece of advice from a crafter with years more experience than I at the time (almost 20 years ago now), told me never to discount or mark down on tags or signage. She said it gave the impression that you are unsure of your ability to sell the items and/or too many people passed them by and decided they were not of value. If they are not selling at the price you have them at, completely change the tags (no markdowns). And you need to price your items for the market or area the sale or bizzar is located. Funny enough, I was not selling some of my larger items I had made that year (3ft Angels holding a battery op candle) and she told me to mark them up at least double. Not wanting to offend I did so, and they all sold within the hour and I had orders for more! Good luck to all of you! Great point! So often artists and crafts people price their creations far too cheap. We keep a display of very inexpensive rings right near the front of our booth. It draws in the young girls, who go get their mothers, who then shop the rest of the booth. Good way to get them in! Not being able to take credit cards is a biggie! Look into Square UP or PayPal card swipers that work on your smart phone! If you’re into Etsy, they now offer an option to take credit card payments through their Etsy Sell app. Having the option to take cards doubled my sales at my last fair. This was a big one for me. One bazaar a customer spent her last $45 cash on our wax melts that are 2 for $5 then asked if we took cards cause she wanted to continue to shop. I kicked myself for the rest of the day for that error. I ordered square that night and got a free reader and sales went up with a sign on table that we accept credit cards. Just set up at a craft fair today. Traffic was light, but even so I didn’t make the sales I had hoped to make even though I had plenty of positive comments. I had already come to the conclusion, though, that the variety of items I sell could be overwhelming. Your article confirmed it. I either need to narrow my scope or find another way to display my goods to make it easier for people to browse. Thank you! I haven’t done a show yet, but plan on being able to create jewelry pieces on demand. and possibly wire wrapped rings. I finally did a show. The wind wreaked havoc on my displays. So… my jewelry was scattered about on the table. That invited people to touch. Most who did purchased. The seller next to me had nice jewelry on display and no one seemed to want disturb her order. Sometimes you have to wing it. I also was able to design rings and earrings while the customer watched. I used to sell chocolates at fairs and found that having holiday shapes in all sizes was great because the lollipops attracted the younger kids. Things were priced so that almost anyone who stopped by bought something…even a 35 cent lolly. I had a lot of repeat customers that bought turkey pops for their Thanksgiving tables, men bought Christmas gifts for the office and even the boys would buy a rose for the girls. The Christmas suckers were displayed on green painted styro cones so it looked like Christmas trees. I use the Square for credit card sales and it really helped my sales about 40% vs cash alone. I also do not have to carry more than 50.00 to 100.00 change now. I even keep the square in my purse. I may run into someone that wants something and I can swipe and go. I always offer a business card to people who say “they are just looking” and I also let each person know that I love custom orders. I have a tripod of custom items I have created in the past. I did a book at first but people “looked” at the book. I decided a video would have the same effect. I have only used the poster once but I did get two custom orders. People never figured a person selling ink pens and journals at a craft event could create a three ft arrangement for their table or flowers for a wedding. This is almost my fifth year. So it takes time to figure out what works best where. Good luck! Thank you for mentioning the amount of change you used. In the “Tips” for which I got onto this site, she just says, “Be sure to have enough change.” I know the prices and location and traffic all make a difference, but having a starting point helps. Thanks again. My booth has actually become so massive that I always have to purchase 2 booth spots to fit all of my crafts. Buyers seem to love the different variety of products I sell and I can have approximately 10-12 buyers at any given moment in my booths and still not feel cramped. My biggest thing is I make sure I make products for the whole family, including the pets. All of my items all tie back into each other theme wise. I myself as a shopper at a craft show, I do not like seeing things that are on a flat table and are mostly mono-colored. For example, I’ve seen booth that sell handmade baskets. I just walk right by them because they all look the same. There was nothing that stood out about them. It felt like I was walking through a hobby store down the basket aisle. I love color and would like to see them used in a colorful way…Christmas gift baskets, baby showers, etc. Another pet peeve I had just recently at a fair was a vendor was almost screaming that her items we $5 at me when I was clearly not even going to her booth, but just looking around at the venue. It would have been nice for her to approach me with a “Hello, how are you” and see if I was even interested in what she was selling. I had a similar problem at a craft show recently. When people were looking at my items the vendors across from me will yell to them they have items for sale too and to come on over and take a look. Hawking is not allowed but people that set up for just one time think they can do that. it is my pet peeve too. this was SO much help. I am interested in so many different types of crafting designs but didn’t want to be all over the place with what I offered, now I am psyched! One big mistake a spending everything you make at the other craft booths! Sometimes I am able to make trades with other crafters. They get what they want & I get what I want. At times I have had to say no to another when they had nothing I needed or wanted or could give to someone. I find bartering with other sellers is a great way to get some value to what I am selling and receive items that I love in exchange. i have been doing booth for 20+ years. lighting. it seem some of these venues can be poorly lit. your products or some special products. I’ve been making jewelry for myself and friends for years now. I was thinking of bringing them to fairs but not sure how to go about getting started. This list has definitely driven home some of the things I was most concerned with. Glad someone put it in writing. Now to find out how to actually get the business started. if anyone has any ideas or suggestions, I’m all ears! Hi, Kara…You might take a look at the We’re all so crafty Buyt/Sell web site. We are all crafters in the Sacramento and surrounding area, for the most part, and we post info on as many upcoming craft fairs/events as we can so that all of us can attend the ones that we would like. Our membership is growing quite rapidly (about 1,350 members currently). Hope you’ll take a look and join us. (I am one of the Administrators, and can add you as a member, if you do decide you’d like t join our group.) Have a wonderful day! #11 – You don’t take credit cards. With the abundance of card swipers that work on smartphones (Square, etc. ), there’s just no excuse to NOT accept credit cards these days! Actually, Tana, there is one tiny excuse….I don’t have and don’t want a smartphone, LOL! Doing business would be the only reason I’d have one, as it raises my household expenses so much higher. (I currently have a very inexpensive Tracfone and no data plan.) I’m on a fixed income (retired) and really have no other need of one. It’s one of those things I’ve been on the fence about. I’m guessing I’ll have to bite the bullet if I decide to do more craft fairs….I have a few months to decide. Actually, depending on the sales you are wanting to make, I think the ability to take credit cards would pay for the smartphone. I was at a craft fair this Fall and made 80% of my sales with credit cards! I also watched the woman across from me have to turn away sale after sale because she did not take them. She probably lost out on $300 in sales that day which would have covered several months of the price of a smartphone plan and the fees associated with the card reader. I, on the other hand, walked out with tons of sales and custom orders (completely paid for!) because it was so easy for them to just pay the totals up front and take their receipt as a text message. Do you ever have trouble with the Square not working due to poor cell phone reception? Square readers will process when you get a cell signal if there isn’t one where your craft booth is. I have had a lot of trouble on both ends of the square reader. I have purchased items and my receipt never arrived and I had no proof that I made the purchase so I couldn’t make a return if I needed to. I have also had issues when trying to complete a sale the reader refused to work due to service. I wish there were a full proof way to make transactions. The square cc is very finicky. Sometimes it helps to clean the mag stripe of the cc on a cloth or even your clothing. Plus, I have request several of them to replace the one that doesn’t always want to work and never charged for additional cards. I keep the old fashioned “knuckle- buster” for taking credit cards when I cannot get service with my Square. It also helps because then there is a receipt for the customer. I have a smart phone through Tracfone… I only pay for what I use…no plan! My PayPal reader and Etsy card reader both work great!. I’m able to get service everywhere everyone else does! Get an iPad and use the square on it. You can see it better and when I did, sales from cc are 65% . Best advice from here borrow a phone and get set up before your next show. Order a paypal for backup and set it up. I went thru this myself a few weeks ago. The show I was doing had a fb vendor page, and so many warned against not having a way to accept credit cards. I was freaked out cause I’d been waiting on a particular smart phone to be released that had everything I needed for business esp. a 13mgp camera, and it was going to be less than $200, well at this point they are 3 months behind on releasing it. I’m a research type and I don’t want to run and get a phone for one day. This all led to an extremely bad decision. I kept thinking there had to be a square or similar app for laptops. I asked on the vendor page no one knew a thing outside of a smartphone or ipad. I googled and googled and came across a 10 best credit card processors for laptop article turned out to be bogus paid for. Long short of it. had to demand daily for 2 weeks, that they let me out of 3 yr. contract and not charge me an etf of $350 or $25 monthly fee. The service wouldn’t even allow me to login the day of the show and I had no idea how many lies and technicalities this company used. I share this because if you ever get into a brick and mortar or think there is better fees than square BE WARNED! I’m with you. We are a retired couple and do not feel like spending big bucks to be constantly in touch with everyone. We use prepaid phones as emergency phones and just to call home. One day we will see the value in smart phones. Not yet, though. I don’t have a smart phone. I’ll be cash only for now. Android tablets work well with the Square Reader too. That’s what I use. Purchased it on sale for around $50 from Wal-Mart. I mostly do flee markets but all these still apply. 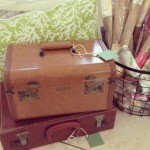 Whether it is a craft fair, yard sale, or flea market we should keep all these in mind. If it was a web site and you forgot to put a price on something, your potential customer would not be able to ask you. Always bring sunscreen and bug spray with you at an outdoor event! I pushed myself into doing my first show a few weeks ago. I signed up 3 months in advance, which is not a lot of time if you are still trying to build inventory. I knew this but I was so out of the loop I had to jump into the frying pan to get some idea of how to do this. I only sold a few things but wow did I learn a ton. One thing, if its your first time or it’s been a long time since you did this, at the 1 month or less till show, try to find a stopping point for making items to sell and work your way backwards. Use this great article and others to picture yourself in your booth setting it up and then selling and write a list of what you are seeing you need. Start packing all the odds and ends from tape, scissors, calculators etc.. I do several things to boost sales at craft shows and the markets I do weekly all summer. Taking credit cards is the first big thing that has made a big difference! That has captured many large sales that would have been lost when the customer commented that they didn’t have the cash on them and I was able to tell them that I could take PayPal if they had an account or a credit card. The other thing I do is keep two price tiers- I crochet and on my apparel goods I have the “high end” goods that have a hefty price tag on them and I have the lower price tier. Not lower quality, just quicker to make, simpler items like basic hats, scarves and mitts that are lower priced and offer a quantity discount for multiple purchases as well. This works out really well. I also attract the younger kids with baskets of hair scrunchies and things like that for a buck or two and offer baked goods and candies in both larger and smaller sized packages for different needs and budgets. I pretty much always walk away every week sold out of the baked goods and usually have a few gaps to fill in on the crochet tables as well. I take crocheting with me and often end up doing demonstrations- especially if I take a doily to work on. People friendly and busy every minute all through two markets a week all summer! Hi! I love all of these suggestions. Last week I was at a craft fair and I completely skipped one booth because the artist was sitting directly across from the booth entrance just staring into my eyes! Being friendly is good, HOWEVER, don’t be PUSHY. I have been attending, and selling at, various festivals over many years. My pet peeve is when I am browsing (includes retail stores, too) and the artist comments on EVERY SINGLE THING I look at. So … I walk away! Give me my shopping space. Don’t micromanage your potential customer’s browsing by thinking you have to comment on every thing they pick up – it’s a turn off! Thank you for these tips – and as a buyer I can’t stress your #6 enough. PRICES! Please. It gives buyers the idea that you’re “sizing us up” and might tell us higher prices. Is it laziness that sellers won’t display prices? As a seller, if I haven’t had time to individually price my items before it gets busy (hey, it happens), I make signs with the prices and place individual signs next to the displays. The items I sell can differ slightly depending on the venue and sometimes I get a last minute offer of a booth availability and don’t have some of my things individually priced. Signs are great! I absolutely hate having to ask a seller what the price is for multiple items, let alone a single that I would otherwise have bought. Sometimes, I don’t want the spiel or patter. I simply want to give you my cash and walk away with my little beauty! I had a suggestion to me about ornaments. Buy a couple of small Christmas trees and display them. This gives you extra lighting, height variation and you can display your product in action. You could even sell a tree as a whole. I’ve found that people don’t want to “mess up my display” and so won’t take ornaments off the trees. Using the dowel rod idea, you might graduate the rod length to mimic a Christmas tree shape. Set up a fake Christmas tree and put all your ornaments on that tree with the prices on them. Don’t make them so expensive that the person can’t afford to buy more than one. A twiggy branch painted white with maybe some glitter. They will most likely know you are not selling the branch, unlike a Christmas tree, and the ornament will stand out on its own. I have heard that if one touches something while browsing, he is more likely to buy it. I sold ornaments once at a Christmas craft show, and I used a wooden laundry drying stand to hang them on. I wrapped the poles with garland and it worked quite well! I love all the ideas of how to have a great craft sale. My daughter and I are doing one in October. We make jewelry. My head has been swimming with trying to think of all the things we need to do to make the booth stand out and our jewelry to be displayed to make them show the best. I am excited and hope it’s a great experience. If you can, display jewelry on black velvet. You may also want a light like you see in jewelry displays at Wal-Mart to Kay’s jewelers. Whatever kind of light that is, makes everything sparkle so well. Lots of good tips here… I would like to add to the tips on signage. Unique, flexible, neatly lettered signage can make a big difference in foot traffic. Sure, it’s great if you can do fancy lettering, but nice, neat lettering with bright colors and simple flourishes will do the trick too. I like to use big pieces of slate and chalk. It lets me change my signage for the event, as I range from medieval to steampunk in my venues. If you dip the tip of your chalk in warm water, the color will be brighter and more resistant to rain if you’re outside. If you can’t find slate, a can of chalkboard paint can make anything flat into a chalkboard. Thanks for sharing this advice! We’re intrigued and can’t wait to try it. *Stay outside your tent (set up your chair close but NOT in the tent space). it tucked at an edge so no one stumbles over it, heh. * Post a sign offering to hold large items until a half hour before event closing. * Post a sign ~ “CUSTOM ORDERS WELCOME” (if you do them). get around to it 🙂 SUPPORT others…Have fun! I learned the hard way that it is not a good idea to sit outside of your booth–ever. Instead, create a small space inside your booth that will allow you to be unobtrusive yet keep an eye on those who are browsing your items. It would be nice if all shoppers were trustworthy–but they aren’t. Once you’ve had expensive items stolen because your attention was diverted, you’ll learn that it’s better to keep your inventory in front of, rather than behind, you. That way, when someone stops to talk, they remain within the field of vision of what is taking place inside your booth. Very helpful tips–thank you! Not having enough business cards, change or shopping bags are easy-fix mistakes that I made as a beginner, but I’m still trying to figure out the nuances of pricing, display balance, and customer interaction. I’ve been selling at craft shows and bazaars for over 20 years and this list is pretty accurate. Lots of great information to apply. I will put in my two cents about a few things. Nowadays with people not really carrying cash or writing checks I do think accepting credit cards/debit cards is a must. Most venues have ATMS at them but most people don’t want to be bothered or pay the fees. So take the step and start accepting them. Your sales will increase. With that being said be VERY careful with who you choose to process those transactions because there are a lot of scams out there that will cost you tons of money not to mention the headache and hassle. Please do your research. I personally use Square, PayPal and Propay as my credit card processing. As for pricing. Be sure you are figuring the cost of what it takes to make the item. Include all the supplies involved. To many times I’ve talked to other craters about pricing and they don’t even know the cost of making the item. If you don’t have that number how can you price it to know you are making a profit. You don’t! I keep a notebook with the details of each item I make and all the supplies to make it. This way I can refer to it again. Also, as an artisan don’t sell yourself short. People are paying for your expertise and creativity and your prices should reflect that as well. Lastly for now. I always suggest that if you are new to shows or coming back to craft shows it’s always a good idea to do a dry run for setting up your booth. Most shows these days have 10×10 size booths. Mark off this area and setup your tables and displays. 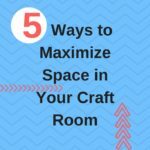 This gives you time to figure out how everything will fit and look in your space. Otherwise you will waste time trying to figure it out which sometimes will cut into the show time. If this happens it looks as though you are not prepared and people won’t stop to see what you have. Plus you feel rushed and out of sorts. It’s always a good idea to do a dry run if you are just beginning to do shows or if you have changed your displays. Best of luck to all! Hope everyone does well and is successful! Take a picture of your booth so you remember how it should look when you do set it up at the show. Take another picture at the show also. Each time you will find ways to improve it and make it stand out. Great article been doing this 35 yrs changing mediums All tips right on. I treat great each person they don’t have to come to my ” shop” so be thankful. Cards a must way of future. Over half my sales are cards. Actually do a show where no cell coverage. What do you do ??? I also sell handmade greeting cards in stores and to friends. I cannot afford to pay for a booth or table as that cuts my profits too much. Stores may double my wholesale price but at a craft fair that is too expensive. Luckily I have one venue that is free and even gives venders a box lunch and treats. I believe Square now has a system where a transaction can be entered at a later time. It is in their directions, etc. They started this for areas that may have poor cell service. Anymore, customers expect all vendors to accept cards—and customers are carrying less cash and checks. Don’t miss any sales! I just did my 1st craft fair and it went well and am booked for 3 more shows. Was wondering if someone could help me with how to price items though? At least twice my supply cost works for me for most items. I don’t count time or it would be way too costly! A huge “no-no” in my book is when the seller is sitting on a chair in their booth & never speaks to the customers. If I have a chair in my booth (which is rare) I stand each time a customer approaches & I greet them. I have 2 handmade shops on etsy (One handbags / yoga bags & one dog leashes & collars) that both donate to greyhound rescue. People often find this fascinating and it builds a conversation. If I’m doing a pet event, I just take the relevant shop with me. But if it’s a greyhound event, I bring both along as the locals here all know me and expect to see everything! 🙂 But it does make for a challenging set-up. I fill a 10’x10′ space with each shop easily & I’ve never set up the booth the same way twice. The other challenge, fitting shoppers WITH their dogs into the booth. Not only does there need to be plenty of space but, everything has to be waist high in case….a dog lifts his leg. Yep, that happens! I have a retired greyhound that I adore! Thanks for donating. Great list, however I would need to disagree about the “you don’t offer sale items or freebies”. You don’t need to offer a discount or freebies to have a successful show. I have always tried to square away some time at home – maybe the night before a show – to setup a mock booth layout. I’ll usually use the kitchen table and arrange any decor (flowers, moss, branches, etc…) and my displays. I’ll then take a picture for setup the next day. It really helps me to go into a show knowing that I have a plan. Making a list and packing a small tote with “supplies” helps, too. I usually include items like scissors, twine or string, tapes, business cards, receipt book, rubber bands, pens and notebook, and extra pricing materials. Can’t go wrong when you take just a little extra time to plan ahead. You won’t regret the feeling of preparedness. Very hard to predict. Time of year does make a difference—a couple of weeks before Mother’s Day or November for holiday shopping are peaks for me as compared to July or August, etc. Also, try to find out the attendance of past shows and demographics of the area. I am doing my first craft fair, I make wooden crosses. I need suggestions on how to display them. I have two sizes…..six inches and ten inches…. I have been doing the same craft fair since 2010. Every year it has changed my booth has. Last year my booth was taken up by another vendor and my booth area looked small. I still sold all of my craft things though. This year I was bigger cause the vendors around me didn’t take up all of my space. Only problem is all the vendors this year was not having a good year like we did the year before. It comes and goes for this craft fair. I think the only thing that threw my booth off this year was the two vendors with their curtains around their canopy tents. All good advice, except the business cards. Cards cost you money. If people like your work, but they can’t afford it or won’t justify the expense of buying from you, they will take cards as souvenirs. Rather, make little trinket dishes, magnets or tiles with your info on it, and sell them for a few bucks apiece. Make your own business cards. I buy the unprinted ones at Staples or Office Depot and then print some at home for each fair – maybe 10 or so. That way I can update them as needed and always have some on hand but I don’t need to buy 250 cards or more at once. I use the old knuckle buster credit card machine. People may laugh but hey, it works. Don’t have to worry about not having any service, etc. I have done shows 25+ years with it and my sales increase every year. It only takes a matter of minutes to dial in the information once I get back home. My customers are relieved to know their private information will not be hanging around in cyberspace either. As for business cards, I make my own and then flip them over and print all my up and coming craft shows on the backside. Everyone loves them and knows just where and when I will be next. Happy crafting! Some great tips, thanks. Loving some of the extra ones in the comments too. Another is look at the event as a marketing event not a sales event. This can help you to not pressure people into buying. You’re there to advertise & sales are a bonus. Stay on trend with your products. I have done shows for over 20 years. You need a walkin booth not a flat table out front, it is too easy to pass by, also lighting is a must and I carried the puzzle piece cushion flooring with the edge for strollers to roll right in. My customers stayed longer with comfy feet. Anytime you can personalize while a customer waits or have it ready before they leave, get your money at point of sale, then the sack is ready when they come back. Credit cards sales are a must and women come with $20.00 bills to start the day, so be prepared with lots of change. Put a business card at edge of table and in the sack. Also don’t use cheap sacks, there are plenty out there for you to buy representing that you are a professions sales person. Good luck. This has been an entire education in itself. Question Pleases: Does anyone have a type of drawing for product, etc. where you ask your potential or actual customer to fillout their name and E-Mail? If so, can you compile this list of E mails to send promotions to the people who filled out the slips.?? What about if I ask permission when they give this to me if I could E mail them about my products and specials? I can’t speak to the legal question, but I can tell you that we do offer a chance to win a product at our shows. We have small slips of paper printed with our logo, and spaces for customer name, phone number, and email. The entries are put into a large plastic container, safe from prying eyes. We do tell them that they will receive an email from us. A sign informs them of this and tells them a complete form is required to win the product. If they don’t put an email or phone number on the slip, we don’t award them the prize. Also, do not use a single piece of paper where one after another lists their personal information. This is not a good idea. Anyone can snap a photo of the paper and have information that your customers may not want in the public domain. 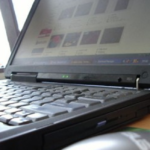 Yes, it is legal to email or mail information to your customers or potential customers if they agree. Just have them sign their: name, address, email address on a guest book similar to those at wedding receptions. I have been doing shows for several years….and my biggest piece of advice would be to really THINK about the product you intend to offer before jumping in too fast. In our area there are about ten different ladies making homemade hairbows. The same with little girl’s tutus. Our area is saturated with them, and your market share would be very….very….small. Instead, find a unique product that you enjoy making…I did handcrafted rag rugs for years, and my sales were amazing, mostly b/c i was the only one in the area doing this. People will pay a premium for an item that is truly unique, or the making of which is a lost art (think stained glass, hand-strung dream catchers, woodworking, leather crafts, etc) Take the time before you jump in to go to several craft shows. Keep notes of the items that are popular…and steer clear of them (in our area every other booth is offering western-style buy and sell purses, for example) Consumers get bored looking at the same thing over and over.People are not going to take the time to look at 20 identical booths and will walk right past yours, even if you have the best prices, once they are over-saturated with the item. And though most organizers will try not to put identical items next to each other and limit the number of same-type items in one show…they are still in the business of making money and selling booth spaces, and when it comes right down to it, they are going to sell the space. Keep in mind that if you were setting up a brick and mortar business, you would not put a frozen yogurt shop next to an ice-cream parlor that is two doors down from a gelato shop. Same thing with craft shows. If there are a ton of people in your area already doing jewelry…don’t do jewelry, etc. ALSO know your net profit ratio! This is your profit after ALL expenses have been paid. Most larger companies hope for a 33% net profit ratio…but I have found that to be successful as a small business person, you need to at least double (if not triple) that…and adjust your product/prices accordingly. One thing I didn’t see mentioned was know your market. Our most successful craft fairs were the art and wine festivals in the San Franciso Bay Area. We sold beaded ID badgeholders for $10 each. This was back in the 90’s when most badgeholders were the shoelace type or plastic beads. All of Silicon Valley employees wear badges so you’d think this was a good deal. We would sell a couple at each fair but when we raised the price to $16 each they started flying off the shelves. The perception was that at the lower price they were of lower value. I loved doing the festivals and miss it sometimes (not the setup nor the breakdown!). Good luck to all of you! – Bring a folding cart for ease of transport in/out. I use a Total Trolley and it’s great. – For credit cards, many places do wifi. Check ahead to see if it’s available and make sure it works before the show starts (get password/instructions). I use a prepaid phone, but don’t need to add data plans because the shows have wifi. – Bring a stylus for buyers to sign with. Finger pads are highly inaccurate. – Bring extra tablecloths. I’ve been given free spaces when late cancellations would have otherwise left the space empty. – Arrange items by color or theme. Retailers do this all the time. You’re a retailer in this situation, so take a cue from the big boys. – Use displays that can be flexible. Depending on your space and neighbors, you may have to change your plans for best exposure of your products. – If holding items, get name and number. I’ve had people buy things and never come back to pick them up. – Before doing a show, scout it the year before. Better to find out that way that a show has low traffic or incompatible items and would not be a good fit/choice. Check with vendors to get their thoughts. – Dress the part. I sell Christmas items, so I always wear a Santa apron. You’d be amazed at the comments I get and the conversations it starts – leading to sales, of course. – Lighting is far more important than you think. Make sure your both is well lit or attractively accented. – Wrap items in tissue paper. It shows you care, heightens the value and protects the items – all for very little money. Very Informative!!! Thanks for sharing!!! I, personally have always acted and presented my artwork and food-stuffs with the old saying (I think from television) …”YOU NEVER GET A SECOND CHANCE TO MAKE A FIRST IMPRESSION”. This seems to hold true no matter what is portrayed- presentation, manners, merchandise, quality or whatever. The only other things I religiously follow is to treat others the way you would like to be treated, and create your artwork with the care and attention you would want for yourself. Thanks for sharing! Great advice! I’m doing my first craft fair this month. I live in a small town and the size of the craft fair is about 6 or 7 vendors. Two of them make little girls tutus and another two make bows. My question is what would you pay for shabby chic painted frames with twine and decorated clothes pins? I’m about to do my first craft show and I’m I glad I saw this site! Many helpful details. Some I had thought about as not a big deal, but now I’ve changed my mind. Will use most, if not all of what I learned. I wish there was a place you could go to learn about loading and editing your products onto your site that is if not free, VERY INEXSPENSIVE. I made the mistake of buying into an online program that “teaches all you need to know to setup and start your online business.” A very expensive lesson was learned the hard way. Still trying to recover my losses 18 months later. I make home made healthy dog treats (I know like several other people). I have been thinking of ways to make mine different than everyone else. First is with my packaging. Everyone one I’ve seen who makes them has the exact same packaging. Mine it totally different than theirs. I have even made a brochure with information, ingredients, and a list of pre-made treats. I am currently working on a “draw in” basket of dog related items (hand made). I need help with displaying them. I have only done 1 show so far. I am trying to raise the money for a huge one in Sept. I want my display to be different and eye catching, without being too over whelming or gaudy. How many flavors would be too many? I currently have 9 and ideas for at least 8 more. Accepting credit cards DEFINITELY increases sales! Dave Ramsey tells the truth – we WILL spend more with plastic because it’s less painful than parting with cash! I use a small, 40-watt, lamp in my display. It adds a “homey” feel that appeals to women (who are my target buyers), plus a string of Christmas lights along the back-edge of my tables. I use BLACK to-the-floor table coverings. They are VERY affordable (Amazon) and look sharp, PLUS I can hide boxes and inventory. Suggestions about a CLEAN, organized and clutter-free, and “interesting” display are RIGHT ON. It DOES make a huge difference in how people respond. I’m also convinced it shows CLASS, and CARE about what you’ve sunk heart-and-soul into! I’m doing my second-ever “summer” event…I generally theme my items (paper-crafts) for Christmas. This is new’er territory for me, trying to prepare for gift-giving occasions that aren’t holidays. Thanks to everyone for chiming in! Here’s to a successful selling year!! Love all the comments and ideas! I’ve been doing shows for about 3 years now in NC. Most shows I participate in require you to have a tax ID and display it. Just thought I’d throw that out there for newer vendors. It’s easy to get and most community colleges have a small business centers that can help. I don’t think we’ve ever set up the same way twice, and I get 2 booths for less expensive shows, it allows you to spread out which is more inviting to customers. I always sit in my booth at my workstation, people buy more when they can SEE that you actually do make the items you are selling! I have enough inventory to almost be overwelming, however I sell more custom-while-you-wait items than pre made. My biggest suggestion is to speak to everyone that steps into your booth, then just let them look, if you are making something they are more likely to purchase something. And lastly, business cards… I used to have my cards out in the open for anyone to grab one then I started noticing junk emails then weird numbers calling, at my next few shows I only had them available upon request, and I did not have those problems again. Apparently some people sell your info, so please limit the info available on your cards. I sell totes and purses so my price range is $5 to $50+. The Square card reader is a MUST. I hope they extend their service to accept debit cards. Huge turn off to me is loud or over talkers. It makes me feel like I’m deaf and dumb. I once had one vender try to make me feel guilty for not buying her products…sorry but I can’t wear anything but gold jewelry…..period. I’ve also got the guilt talk from the organizer who encouraged all of us to buy from one another. Sorry BUT I’ve been down that path where I have bought from MANY others and never had the favour returned. My NEW rule is that I don’t buy until my table/spot is complete paid for for that year and next. As mentioned above, scents are brutal on my allergies and always ask not to be placed by candles or anything similar. I only trade at the end of shows as I don’t want to have my nicer things taken. I tag everything with prices as I make them…huge time and stress saver before a fair. Pricing items..oh my. I found a wonderful app called eStorage. I record all my supples and what I make from them and what I will be selling them for. It also helps at text time when I need to know my supples and inventory. I also have a Exell spreadsheet that I tally receipts and sales on. As said above, in essence, don’t give it away. I also have an ETSY store but I NEVER post all my items..too $. TAGS!!!! All my items have tags stitched in to them just in case my card goes missing. I’m new to craft fairs, currently have two under my belt! I found a small basket of candy and a smile to mom asking, is it okay for your child to have a piece, put mom’s with kids at ease and they shopped longer. Not one said no, children were all polite, plus it broke up their boredom. The mom’s loved happy kids, the kids loved something was for them, helped my sells a lot. Inside sales so didn’t have to worry about chocolate melting! Will add some sugar-free candy next time. Also walked around that morning after my setup was finished and offered a piece to other vendors for “breakfast”. Great way to meet and greet other sellers. Throughout the day as vendors stopped by my booth they had to tell me what time they had finally ate their “breakfast”. We’d share a laugh and conversation. I believe getting to know the other vendors has helped me tremendously. If you are friendly they are quick to offer advice or answer questions, which I’ve found to be priceless! As far as taking credit cards, I’ve found it to be a good idea. Being in a rural area most vendors are still cash only. Buyers seem pleased too. Best advice I was given before my first show, display up! Items laying flat on a table don’t show well. Think like a retail store, treat you booth like it is vertical not just horizontal. Along with tables, I use metal racks and crates to build my booth upwards. Thing friends make fun of me about: I bought handled bags and an ink stamp. I paint and then stamp my business name on one side of each bag. Also staple my business card on back of every bag. I look at it as advertising as my customers are walking around! With business card on every bag, I don’t have to worry about forgetting to throw one in bag at time of sales. Loved reading all the suggestions, I knew most but nice to have reminders and read some great suggestions I was not aware of yet. This old dog still learns something new!!! Thanks! I am fourteen and am hoping to go and sell at my first craft show. Nowadays, there is another alternative for the squart reader, maybe not as popular.. but use PayPal. They can pay directly using it. I like my square reader tho, haven’t been anywhere where service was sketchy yet. I found the PayPal reader to be very glitch and totally undependable. I threw mine away and only use Square . . . I have been doing craft shows for 25 years. I use to make a living at it but now its just a hobby. In the last few years I have been doing the 2/ sale . I price my items .50 cents more and if they buy 2 they get 1 dollar off. example 4.50 each or 2/8.00. its been working great. I sell one and she talks her friend into buying the other. And they save a dollar. Don’t forget the kids, parents like items 1 to 3 dollars for the kids. My wife crochets and sews and I do woodworking. Both began as hobbies, a means of relaxing, but the minute you go for your first craft show it becomes a business. We basically only do shows in Ohio and Arkansas, we live in Ohio so we have a vendors license and collect and pay sales tax semi-annually; however, in Arkansas at the end of the show we write a check to the state for sales tax on our total sales for the show. To make things easier for us we include the sales tax in our pricing, this is where some vendors have a problem say your total sales is $1000 and the tax rate is 10% they compute the tax due as 10% of $1000 or $100; however, the actual method of calculating sales tax due would be (Total Sales – (Total Sales / 1 + sales tax rate)) or ($1000 – ($1000 / 1.10)) = $1000 – $909.09 = $90.91 or $9.09 less than the strait % calculation. If you do include sales tax in the price make sure you state it else the state can say you owe tax using the first method shown. The $9 savings can usually pay for us a sandwich at the show. I am doing a church sale and craft fair (separately) and want to know how to display hand-made DIY journals and notebooks. Will also be displaying some magnets and greeting cards. I was thinking of giving a free bookmark with a purchase. Any suggestions for display? Very good points . . . however, I disagree with #10. I have tried both freebies and sales. I’ve found that if you have a sale table, that’s all people look at. They go right to it and totally ignore everything else in the booth. I will NEVER do another sale at a craft show again! I(n addition to those who are ONLY looking for sales, IMO, it cheapens your whole display. I even had several people want to know when my regular priced items will be on sale. Have confidence in your products and the time you spent making them. If you’re looking to get rid of stuff, wait until you have a yard sale at your home, or use them for the door prizes that a lot of craft shows collect for. As far as freebies go . . . it’s the same scenario. People see that you’re giving something for free . . . they come into the booth and get it, then leave without even looking around. I DO, however, give out free pens (with my website address) to people who sign up for my newsletter. I sell interchangeable jewelry with tons of small charms. When I set the charms all out neatly people glance and walk by. If I throw them in trays by category, then it’s like a treasure hunt. Women love to dig through and seek out those perfect sparkly charms. Kinda freaks me out because I am OCD and this seems so chaotic to me. However, they are organized by theme and bling. It brings in the sales every time. Subscribe to the Creative Income Newsletter. Start a Handmade Business: Free CreativeLive Class You Don’t Want to Miss! 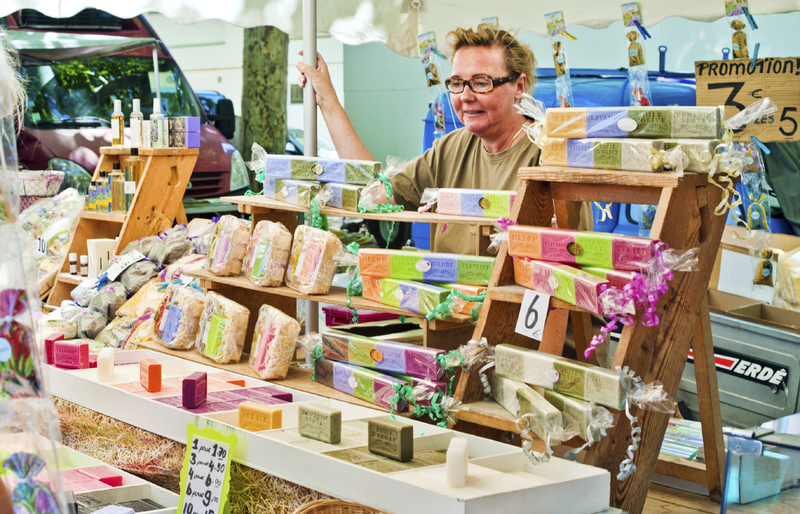 Should You Offer Samples of Your Products at Craft Shows? Copyright © 2019 · Creative Income - A Prime Publishing LLC property. All rights reserved.